There are Square Bases, Round Bases, and Oval Bases for your Tempered Glass Cube Displays. 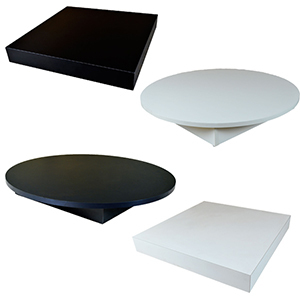 The Square and Round bases for Retail Glass Displays comes in two sizes and either black or white melamine color. The Oval Bases comes in either white or black melamine color. If you don't see the size or shape you want, call us at 800-426-5708 and we can get you a quote for the size you need. Click here to see our great selection of Tempered Glass Tower Displays.